Discovering new foods is one of the true joys of eating, and when you’re following a plant-based diet, it seems like there’s always something new to try. According to the World Economic Forum, there are more than 400,000 species of plants on the planet and at least half (yes, half!) are edible for humans. But, even with all those options, experts estimate we only eat about 200 plant species. And, remarkably maize, rice, and wheat account for about half of the plant-based foods we consume. There’s nothing like delving into the category of “usual foods and vegetables” to inspire new meals. Some days we find surprisingly delicious plants that make it into new recipes right away, but other times we realize edible doesn’t always equal tasty. Whoops! A few plants have piqued our interest recently. You might even recognize one from Purple Carrot recipes. Salsify is a root vegetable with a mild oyster taste when cooked. Available October through January, pick roots that are firm and smooth with their green tops still attached. 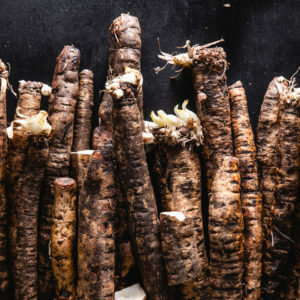 Like other root vegetables, salsify can be boiled, mashed, roasted, or sautéed; try it on its own or in soups and stews. Fresh jackfruit is still relatively rare in American grocery stores, but you may find it every so often. 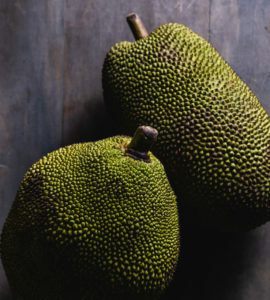 Jackfruit are in the same family as figs and fresh ones have a slightly sweet flavor. When selecting jackfruit, look for one that’s light brown and has a strong fragrance. But, that said, there’s no shame in buying a can of jackfruit. Check out the Purple Carrot recipe archive for our favorite ways to cook with it. BBQ anyone? The prickly pear cactus produces edible pads known as nopales. The pads can be eaten raw or cooked; when cooked they have a slightly slimy texture and a lemony, green bean flavor. They’re in season spring through late fall. 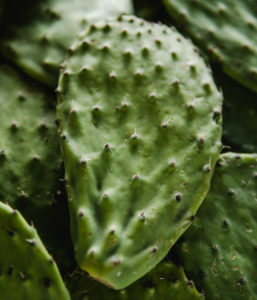 When picking nopales look for ones about the size of your hand that are pale green and firm. Nopales can be grilled, fried, boiled, sautéed then added to your favorite salads, stir-fries, or latin dishes. Stay tuned to Purple Carrot menus to try more unusual fruits and vegetables!